Game Wallet represents the normal incremental development for my previously known "Free Secure Wallet" , this time with more features towards the goal of "Your data is safe and secure".. Here is the old features that already exist in the previous version..
1) Password to access the application. 2) 3-trial then the application closed and you need to re-lunch it to try again. 3) Your entries encrypted against your password. 4) Your login session expire after configurable time of login (default 30 min), so if you forget the application running, no one can use it. 5) Forced password can be set, to be used if you are forced to open the application and application will open without any of your entries. 6) You can sort the entries. 7) You can edit/delete the entries. 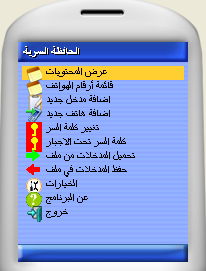 8) Support of Arabic/English interface. -Re-import them in case of mobile crashed or if you got a new mobile with the application installed. 1.Separate the notes from phones into 2 different lists , where call button appear in case of phone lists. 2.Increase the size of entries fields. 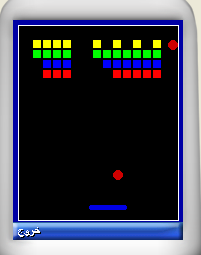 3.Game interface to hide the application behind. -Game Icon for the application. 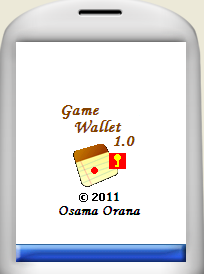 -Named "Game Wallet" instead of "Free Secure Wallet". Click here to Download it from Mobango and here to download it from GetJar.